There are many versions to this true story and this is mine. On a summer's day in 1879, an amateur anthropologist and his eight-year old daughter were exploring the area around Santillana del Mar, when they came across an opening to a cave. It had been exposed a few years previously by a landslide provoked by heavy rains. A hunter had chanced upon it the year before, but finding no bears or wolves, he continued on his way. Intrigued, father and daughter lit their charcoal lamps and climbed in through the entrance. As the anthropologist scoured the floor for bones and arrowheads his daughter looked up to the cave's ceiling and exclaimed, “Look Dad, they're cows! ( Mira, Papá, son bueyes )” . What they saw now forms part of Spanish and World culture. 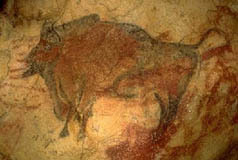 The Altamira site is one of the greatest collections of cave paintings ever discovered. One critic called the cave the “Sistine Chapel of the Quaternary”. The paintings of bison, red deer, boar and horses date from 14,000 years ago, and were saved from the ravages of time and erosion by an earlier landslide, which left them entombed and protected. Experts were amazed at the life-like details and something remarkably akin to perspective, supposedly “invented” during the Renaissance. The animals appear to come to life through the careful use of the uneven surface of the walls. Everything is achieved with just three colours: ochre, red and black. In particular, the bisons of Altamira have become an essential element in Spanish iconography like Velazquez's Meninas and the roadside Toros of Osborne. 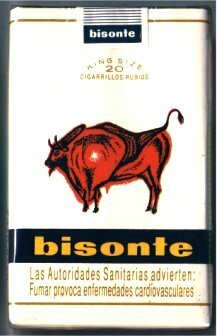 A popular brand of cigarettes (bisonte) even sports a picture of one of the bisons on its packet. At first the cave paintings were visited by a trickle of inquisitive locals, anthropologists and artists. On seeing them, Picasso famously proclaimed, ‘after Altamira, all is decadence'. A long line of great 20th century artists from Henry Moore to Miquel Barceló have been astonished and inspired by them. Miró, for instance, painted this work entitled Altamira in 1958. In an age of mass tourism, the trickle of visitors became a flood, and finally the cave was closed off to public access. The carbon dioxide in the visitors' breath was coroding away the paint. What you now visit is a copy of the cave and a multimedia exhibition, which is what I intend to do this summer, although I believe that if you're not a famous artist or passing dignitary, and you are patient enough to wait for three years, you can still visit the cave itself, as they let 30 people in a day. Of the animals in the paintings, according to one dodgy internet source the last Spanish bison was killed in 12th century Navarra. I have no idea if this is true. Wild ancestral horses also became extinct though the asturcon horse, which still clings on in some remote farms of Asturias, is thought to be genetically close. The boar and the red deer are of course still common. In the La Vanguardia this week is an interesting and reasoned article by Miquel Molina entitled ‘ El chalet del oso '. He uses an excellent new word ‘ Benidormisation ' to describe the commercialisation of the Pyrenees. More and more Swiss-style chalets for yuppies are springing up here in search of profit and powered by greed and corruption. And we also learned in La Vanguardia that if you fancy a dead head hanging over your fireplace, shooting a prize male chamois (rebeco) in the Catalan Pyrenees will set you back 841 euros. Key words: cave paintings of Altamira, Altamira cave paintings, cave painting Altamira, Altamira cave painting, Picasso and Altamira.